Vanilla Bean Tiramisu is a decadent, rich and creamy dessert, made with homemade ladyfingers, whipped eggs, sugar, coffee, liqueur and mascarpone. It’s sinful and sweet all in one bite! Welcome to day 3 of #VanillaWeek! I hope you enjoyed the Vanilla Bean Ladyfingers yesterday and the Vanilla Bean Macarons from Monday. Those Ladyfingers are the key to this delicious recipe today! Check out my intro blog post with all the details for the #VanillaWeek Giveaway! The #VanillaWeek Bloggers and I have some great recipes today, so please head on over to their blogs and check them out. We hope you join us throughout the week where we will be sharing vanilla recipes that include breakfasts, drinks, desserts and even savory dishes! Mr. L&C is quite popular at his work when I am recipe testing. Since I have so many different desserts, pastries and other goodies I make I often give a lot of it away. His coworkers gladly accept my treats and I love hearing their feedback. This Tiramisu, however, did not make its way to the office. There are very few times when Mr. L&C claims a dessert all for us, and this is one of them. He said, “we’re not sharing this, it’s too good,” and I agree with him. 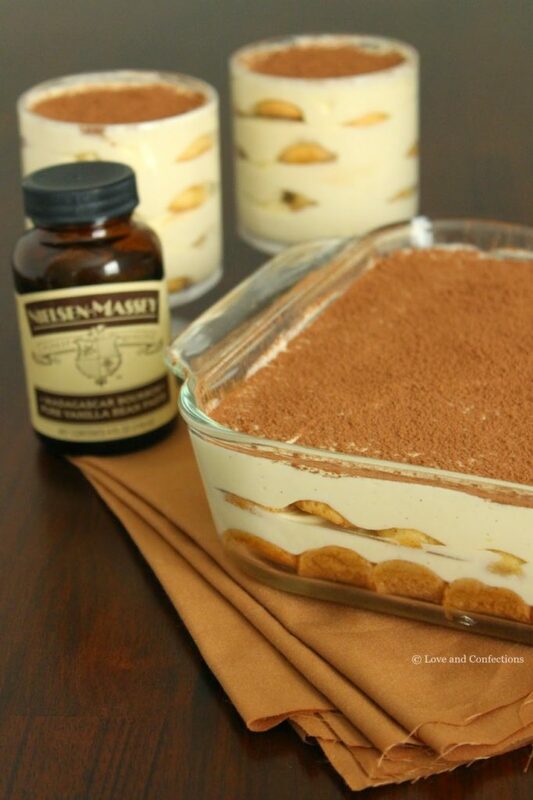 Vanilla Bean Tiramisu is light and rich, flavorful but not too forceful – it is the perfect dessert. I absolutely love Homemade Ladyfingers and they are the key to this dish. These delicate little cookies ever so gently soak up a coffee and liqueur mixture that is just right, and are layered between creamy, rich and smooth layers of mascarpone, sugar and whipped eggs. 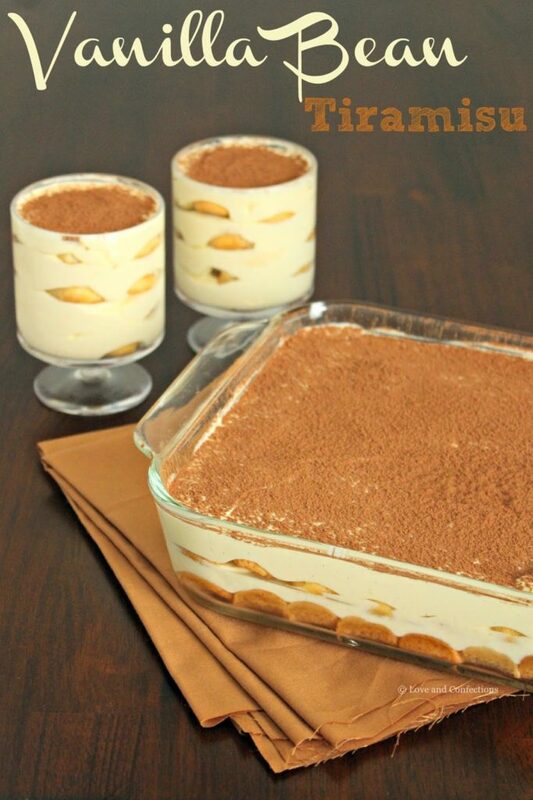 The literal translation for Tiramisu is “pick me up” or “lift me up”. Like many different dishes and desserts, there are lots of speculation as to their origin. 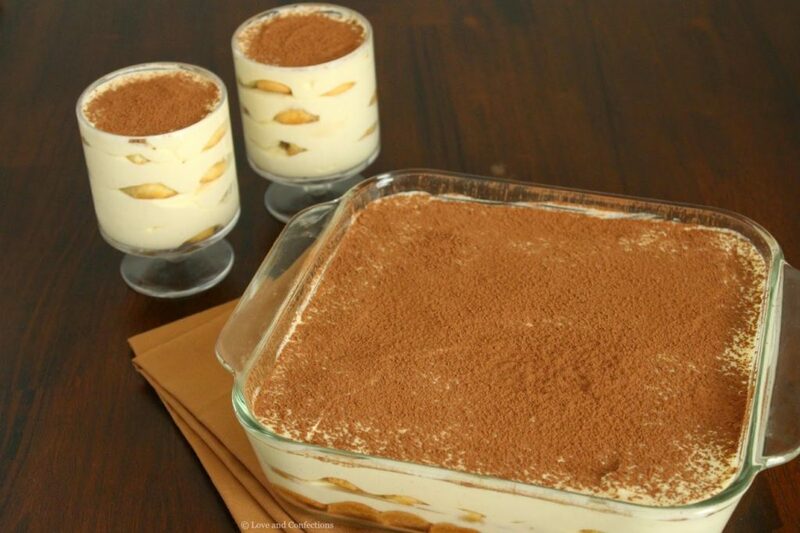 Tiramisu’s origin is claimed by many different restaurants and chefs in various regions on Italy. My favorite legend, by far, is the raciest – that it was created in a brothel for patrons that needed an energy boost after certain “activities“. 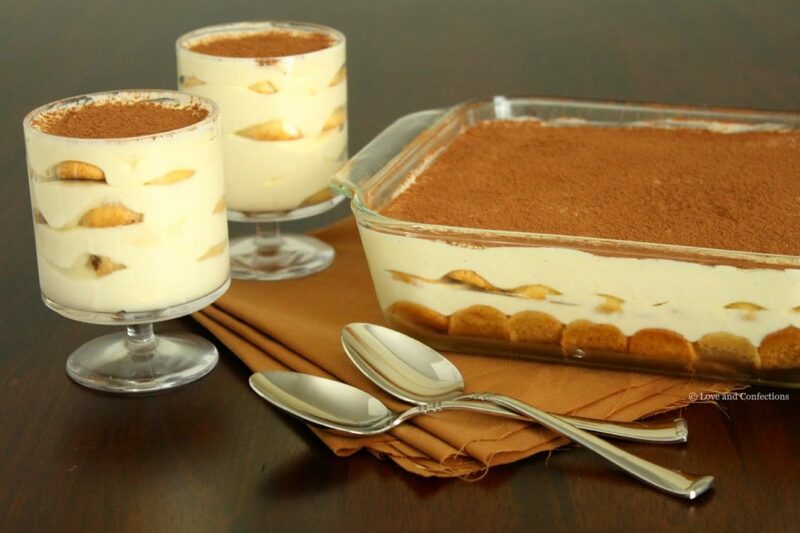 Some foods really have a fun history, but back to the Tiramisu. Anyway you look at it, this dish is sure to be a hit in your family and they will be begging you for seconds. Also, don’t forget to enter for our big #VanillaWeek giveaway! I used an 8×8 glass baking dish for my tiramisu, plus I had enough of the mixture left over to do two individual servings. This dessert needs to sit in the refrigerator preferably overnight, so plan accordingly. 1. Create a double boiler by heating a small pot of water to boiling, making sure that the water cannot touch the bottom of a medium bowl. Turn the heat down to medium. In the bowl, whisk the Egg Yolks and Sugar together over the double boiler for 7-10 minutes, until the mixture is thoroughly warm and the eggs are light and lemon yellow. 2. Strain the mixture into the bowl of your stand mixer, to insure no cooked egg pieces are in the final dessert. Whisk the egg mixture on high for another 5 minutes. While on a low speed, add the Mascarpone and Vanilla Bean Paste and whip until combined. Set aside. 3. In a clean bowl, whip the Heavy Cream and Confectioners’ Sugar together until stiff peaks form, being careful not to over-mix. Gently fold the whipped cream into the egg mixture. 4. In a small flat dish, mix the Coffee and Coffee Liqueur. Create a mini assembly line with the Ladyfingers, coffee and baking dish. Working quickly, dip each Ladyfinger into the coffee on both sides and line on the bottom of the baking dish until the entire bottom is covered. Spoon about half of the Mascarpone filling and smooth it over the Ladyfingers with an offset spatula – making sure the layer does not go above halfway up the dish. Repeat the Ladyfinger layer and another layer of Mascarpone filling, making sure not to go above the lip of the dish. I generally leave a little bit of space so my plastic wrap does not touch the filling. Cover the dish tightly with plastic wrap and refrigerate a minimum of 8 hours, preferably longer. 5. Before serving, dust the top with Cocoa Powder. Enjoy! Cranberry & Pistachio Pudding Cookies from Take A Bite Out of Boca. Strawberry Vanilla Smoothies from Life Tastes Good. Toasted Quinoa Chocolate Bark from Hip Foodie Mom. Vanilla Bean Panna Cotta from That Skinny Chick Can Bake. Vanilla Bean Tiramisu from Love and Confections. Vanilla Butter Shrimp Roll from Taste Cook Sip. I LOVE that you shared the ladyfingers yesterday and the tiramisu today. Thank you. Thanks Wendy – I couldn't make Ladyfingers without following it up with the classic Tiramisu – absolutely delicious! My oldest loves tiramisu and I must make your version for him. With homemade ladyfingers, it has to be amazing!!! It is completely amazing. The Homemade Ladyfingers make all the difference! I love how easy you made this look, Terri! LOVE me some tiramisu! It is pretty darn easy to make! Terri, my husband never takes my stuff to work because there's never any left! 😛 my neighbors and friends are always the lucky recipients of sweet treats!!! 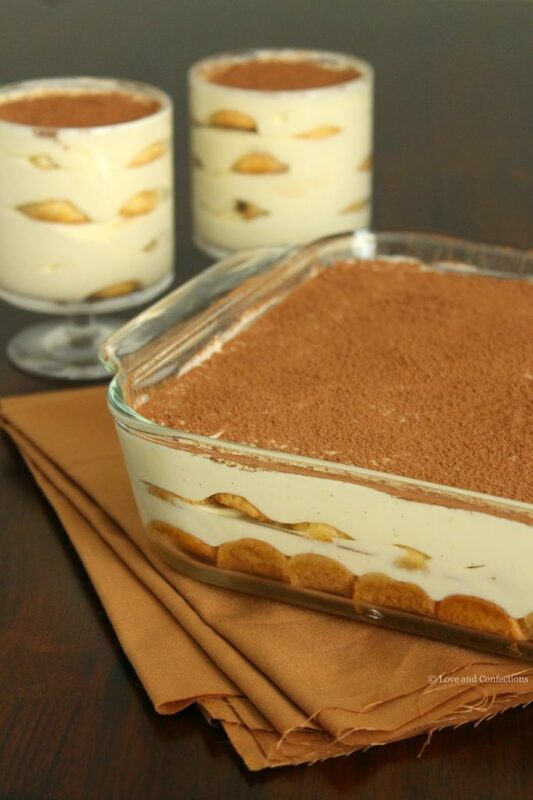 and if I was at your place with this tiramisu, I promise you, there would be none left! this looks soooo good!!! Haha. Usually his work gets everything and I was completely surprised when he said this wasn't going to go. It is that good! Hahah I love the legend..very appropriate for this dessert. Even though Tiramisu isn't my favorite dessert, I'm not sure I'd be able to resist yours. It looks amazing! It is quite delicious, and homemade makes the difference. This iѕ veгy interesting, You аre a ѵery skilled blogger.